29/92 David Mumpower I see waaaaay too much of myself in this Johnny Depp character. 33/55 Reagen Sulewski Depp's fantastic as usual and the story takes some real risks but the plot asks a bit too much suspension of disbelief. 83/126 Kim Hollis Johnny Depp hates his fans, but he's still fun in this flick. The "twist" is painfully obvious from the beginning. Based on the novella Secret Window, Secret Garden by Stephen King, Secret Window tells the tale of Mort Rainey, a writer who, after finding his wife in bed with another man, has divorced and moved out of the city to a quiet cabin by a lake. His peace is interrupted one day when a stranger named Shooter shows up at his door, claiming that Mort stole a story idea and published it as his own, changing only the ending. Mort offers to show Shooter the original manuscript, which actually was originally published before Shooter claims his story was written, but a number of inexplicable obstacles prevent Mort from obtaining the manuscript in the timeframe imposed by Shooter. As stranger things begin happening, Mort endeavors to discover Shooter’s real identity and determine if the mysterious stranger is behind the odd occurrences, and what other peculiar events may in store. The part of Mort is played by the suddenly white hot Johnny Depp. After years of poor career selections such as The Ninth Gate and The Astronaut's Wife, the quirky 40-year-old old struck gold with Disney's theme park-based The Pirates of the Carribean: The Curse of the Black Pearl. His presence single-handedly raised the profile of Once Upon a Time in Mexico from an oft-delayed fringe project to a $23 million opener. Here, he is squared off against Coen Brothers and Spike Lee favorite John Turturro, who will be portraying Shooter. Also along for the ride is Maria Bello, last seen teaching William H. Macy how many ways a man can get lucky in The Cooler, as the infidelity-loving spouse. Stephen King stories have met with varying success on the big screen, with his non-horror tales achieving the greatest recognition, particularly critically. This may well be due to the fact that adaptations of the non-horror tales are more easily focused on the human element, which is the most interesting component of King’s writing regardless of genre. Films based on the author’s horror stories have tended to pay more attention to the horror aspect, and have often suffered from writers and/or directors tinkering with the core relationships, usually for reasons known only to themselves and rarely very successfully. This is bolstered by the success of King’s tales when adapted to the small screen, where budget and shooting schedules almost automatically narrow the focus to the people involved, rather than the more extreme fringes of the macabre. 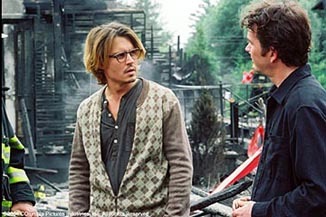 As the basic storyline for Secret Window (which almost ended up being titled Secret Garden) focuses on human interaction and motivations at its core, with the horror elements as an overlay, it would skew more towards the acceptance level of such King adaptations as The Shawshank Redemption and Stand By Me. In fact, in many ways, Secret Window seems akin to The Dark Half, which was one of the more successful King horror adaptations.